» Internet Speed Tests :P Welcome back, Guest. 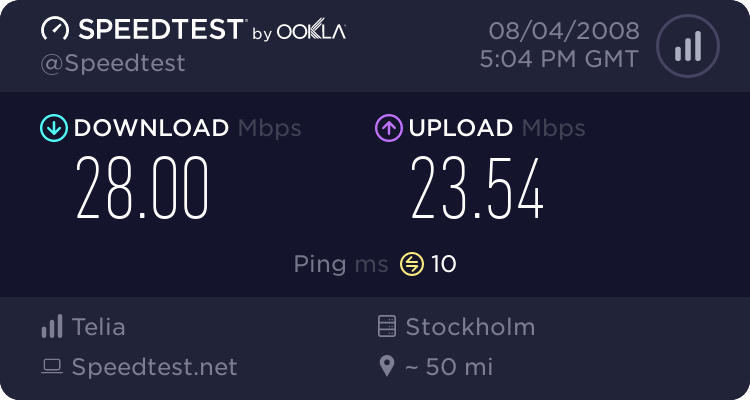 Ok, it's time for the e-Peen award for which Whatpulse user has the best internet connection speed. 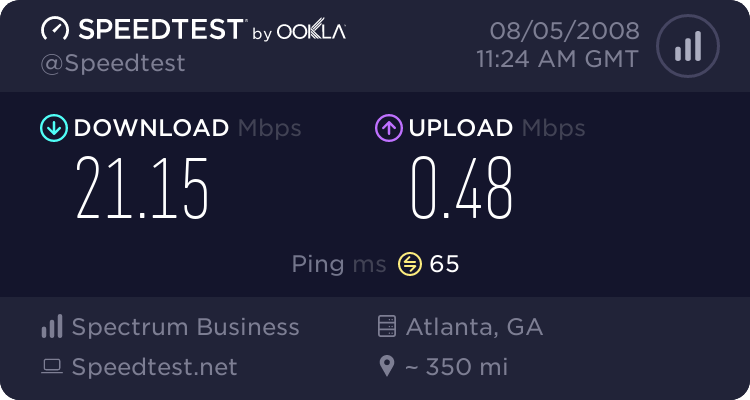 Just link your results from Speedtest.net (use whatever server you wish) and whoever has the best...bam, you win. 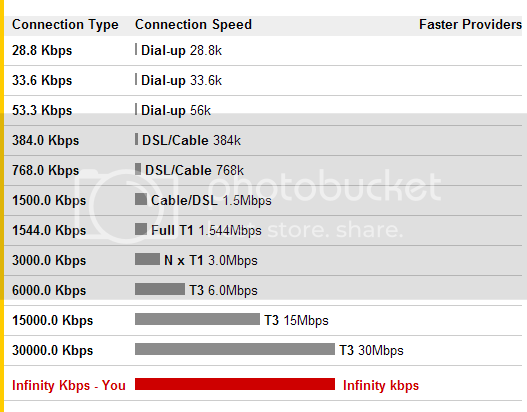 Although I do prefer the 100/100 fiber optic line in my old apartment instead if of this DSL one. I don't even both with these... Unless the scoring is like golf I have no chance. Join us! -- Win Left 4 Dead! -- The Latest L4D News! haha but you know what? I'm not that biothered by being "Slow"
Well, all of this is still faster than the dialup I had back in 2003. 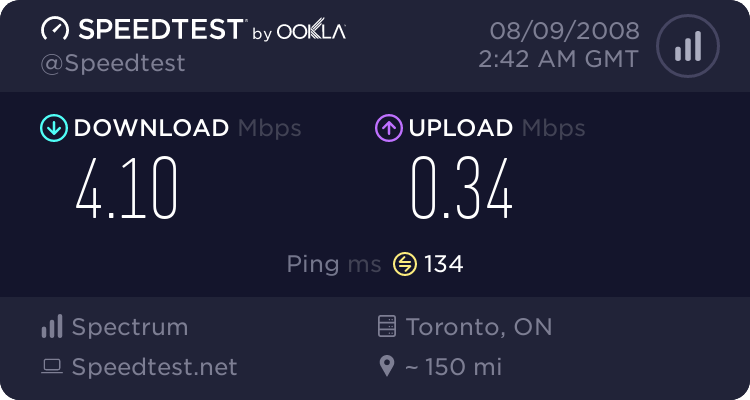 Honestly, dialup isn't nearly as bad as it may seem - though I suppose there are certain things that'd just be horrendous to download, these days. For most browsing, it just takes a different kind of thinking to get you through. If you're the type that uses tabbed browsing, it's just a matter of making sure that you're juggling several tabs at once - for me, I spent more time reading than loading new pages, and that helped me out alot. Hehe, I remember back in -96 when I had 28.8k modem and played diablo 1 all night long. Quarzi Wrote: Hehe, I remember back in -96 when I had 28.8k modem and played diablo 1 all night long. Hey, I surfed astronomy sites all the time, and they had "high-resolution" photographs, too! *AND* I streamed audio feeds from a really neat radio station out of Gloucester, Massachusetts. Too bad they switched genre - went from classical/jazz to oldies?!?!? 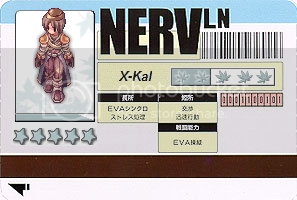 Lol, only you X-Kal. And god, don't remind me of internet gaming on a 56k... /wrist.